The success and development of our small business thrives on relationship with our customers. 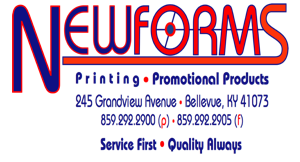 Not only does Newforms bring a team of professionals dedicated to serving your business printing, promotional product, and filing needs, but also it is our promise and outmost intent to develop a strong and mutually beneficial relationship with our customers. Our team utilizes every last resource to style your business, provide guidance toward efficiency, and guarantee that your marketing materials will formally stretch your company/business to new measures. Throughout 25 years of unprecedented experience and remaining true to our reputation, Newforms has built relationships based on trust, an unparalleled commitment to quality, and customer service that we challenge you to find anywhere else. We Work Hard To Earn Your Business. Watch What We Do To Keep It. Once you as a customer have experienced the service and quality of our small family business, it is our assurance there will be zero disappointment or will to work with any other company. Whether it’s the personal attention you get every time you pick up the phone, the convenience of our delivery right to your door, or our ability to turn YOUR MOST IMPORTANT projects into OUR MOST IMPORTANT projects, count on Newforms time and again to serve you. Tom is married to wife, Gina 23 years strong and together have raise five children, all healthy and blessed. Tom New has always been famous for “The Tom New Guarantee” and only for one reason- it is a guarantee that always follows through. Donna Pendery, Tom’s sister has been in with Newforms nearly since the beginning. Once you speak with Donna, you’ll quickly understand why she plays an important role in our business. With any questions, requests, or general inquiries, Donna is the person that will guide you to the answer. She’s purely a kind-hearted person with over 20+ years of experience and gained knowledge in the Printing Business world. Give Donna a call, and see exactly why people believe not only in our product but our absolute highest quality personnel as well. At Newforms, we look toward the future but never look away from the past. We have grown into the successful small business we are due to our commitment to building a future, as well as learning from both successes and mistakes in the past. What a customer sees as thriving, we see as merely surviving. The name of the game in today’s business world is staying ahead of the competition. Here at Newforms, our teams of specialists all have the same desire and passions to see your business grow from thriving, to surviving, to GUIDING. We believe in our work place that we hold the tools and the personnel to take your business, organization, or product to a futuristic level. Here at Newforms, we provide an organized and professional strategy to satisfy our customer needs. Being a business of flexibility and innovation, we take your ideas and make them a reality. We take suggestions, ideas, and implications from our customers and turn it from “what we could do” to “here’s what we did”. Through an easy and 100% painless process, our team provides the necessary tools and guidance for each customer request until together, we not only meet but stretch beyond the goals set by each project. Copyright © 2015 Newforms Printing and Promotional Products. All Rights Reserved.